The ambiance of outdoor occasions can vary from highly-sophisticated to very casual; and because of this, choosing the most-appropriate restroom facility to align with the 'personality' of the event is a prime consideration. If the outdoor get-together involves an elegant wedding, an amenity-filled portable restroom trailer compliments the loveliness of the affair. If a large craft-sale/flea-market or a casual family reunion is being planned, one or more porta-potties would, ideally, fit the occasion. It is, here, where just having access to a sanitary, functional toilet is the goal. Deciding on whether one might select a portable restroom trailer or porta-potty would hinge, also, on budget – as with most things, you will get what you pay for. A porta-potty incorporates a simple, molded-plastic, box-like container that offers a toilet seat – sometimes a urinal, as well -- with a basic-level of privacy and sanitation. With some porta-potties, one has access to single on-board sink. A portable restroom trailer, however, sits on the other end of the amenity spectrum. This higher-end choice can include niceties such as faucets with running water, flushing porcelain commodes, climate control for all seasons, beautiful cabinetry, lighted vanities, wood or simulated wood flooring, totally-private stalls, and more! Basic porta-potties are well-suited for short-term events since they are not equipped with fresh-water-flushing capabilities. With a sporting event, for example, multiple porta-potties could be the perfect choice since attendees are more interested in using a restroom quickly so as not to miss any of the excitement. Here, functionality is the primary consideration. 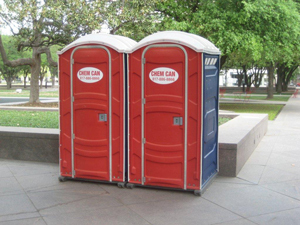 Portable restroom trailers, as mentioned, do have flushing toilets which makes for an experience that is much more user-friendly, more sanitary, along with maximized odor-control. Restroom trailers are designed with larger waste tanks, making them much more conducive to a larger number of users over a longer period of time. Some portable restroom trailers utilize waterless urinals. Waterless urinals, as their name implies, use no water, while still maximizing sanitation. The waterless concept involves urinals that do not flush but are drained by gravity. When urine reaches an embedded trap in the drain, the odors are stifled due to the trap being filled with water that floats on an oil medium. The urine sinks since it is denser that oil, and associated odorous gases are incapable of rising through the oil. Some portable restroom trailers are equipped with baby-changing stations. This is a wonderful amenity that parents with young children, very much, appreciate! A porta-potty actually sits on the moon! Yes, indeed. Astronauts, Buzz Aldroun and Neil Armstrong, left a small portable toilet behind, in the Sea of Tranquility, during their famous 1969 moon mission. The earliest recorded usage of portable toilets dates back to the 6th Century, BC! These worth-their-weight-in-gold items were known as 'chamber pots' in Ancient Rome. Chamber pots, which went by a variety of names throughout the ages, was the go-to design until flushing commodes were invented in the 1800's. Pilots and other crew members on WWII bombers utilized portable toilets due to the great lengths these aircraft had to travel, to and from target sites. During Obama's inauguration, 5,000 portable toilets were available to the throngs of attendees. Solar-powered portable restrooms are becoming increasingly popular. Whether single units or multiple units, these energy-efficient designs require no electrical services yet, still, offer coveted amenities including flushing toilet, running water and more! After it's all said and done, portable restroom trailers offer elegance, and focus on image; while porta-potties offer simplicity and focus on functionality.